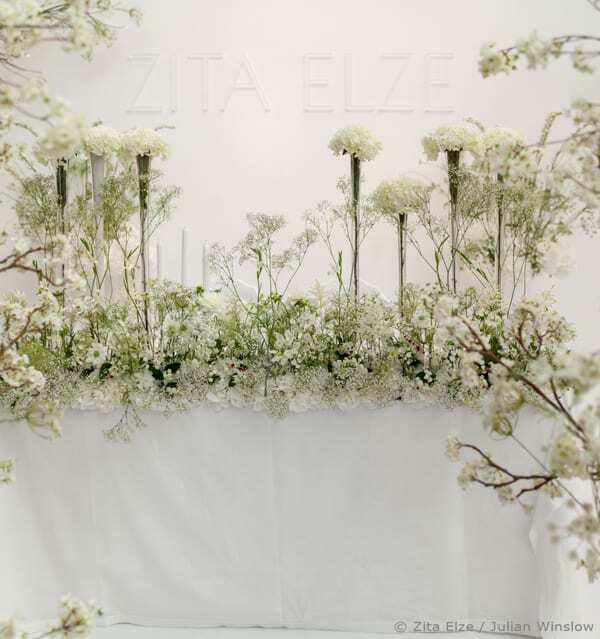 An absolutely breath-taking floral installation by Zita Elze is the focus of this week’s Wedding Wednesday blog post. Zita created the design at Brides The Show, which took place in London last autumn. And I was thrilled to hear that, yet again, she was awarded the Editor’s Gold Design Award! 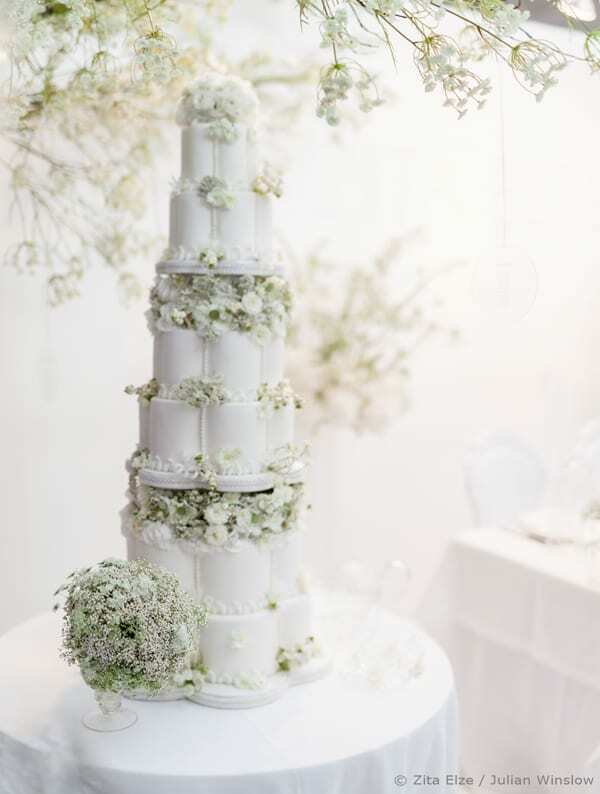 Zita’s concept for the design was pure white, modern chic with sparkling transparent notes, a 21st century fairytale. 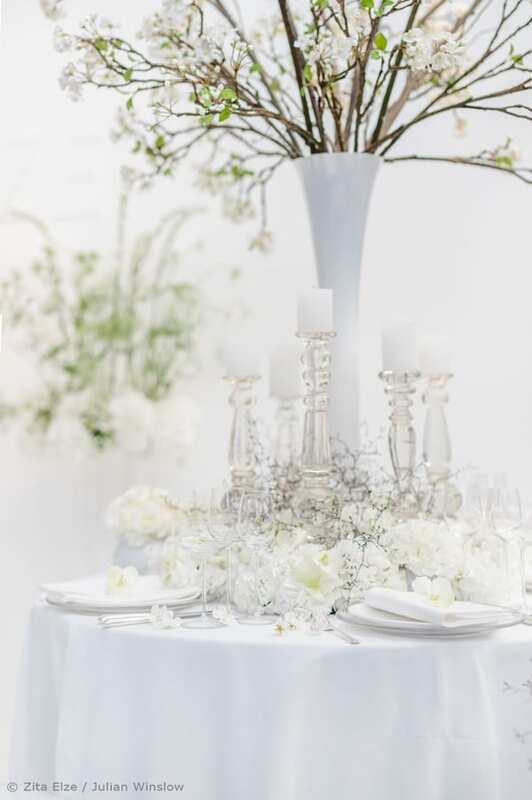 Layers of texture, white on white with touches of green and the tiniest dash of red flecked bougainvillea for the top table. Zita said: “I chose to work almost entirely in white for this project since it offers versatility in all seasons. I actually mixed up the seasons a little with the design, because of my recent discovery of some very good quality faux flowers. Using a measured quantity of these, including some (completely out of season!) blossom, mingled in with mostly fresh flowers I was able to create that feeling of magic that I always aspire to. It’s actually very hard to find really good artificial flowers, so now I’m very happy to be able to offer this mix for the brides who we work with. It can actually help with their budget too. I used the faux flowers to decorate the trees, the arch and mixed them into some of the arrangements. Almost everyone who visited the show found it a challenge to work out which were real and which weren’t, which is just as it should be. 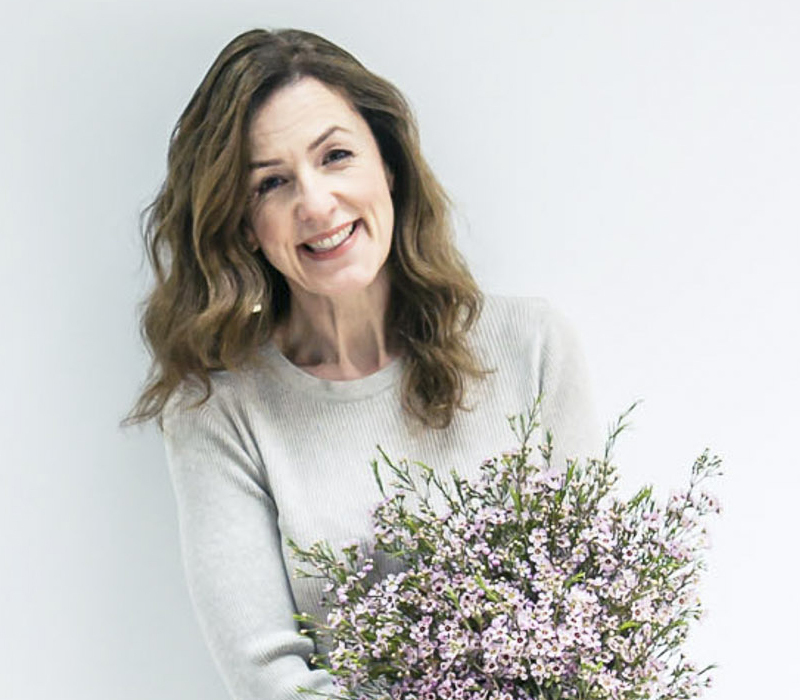 What is wonderful about working in a white palette, besides the long tradition of ‘white weddings’ that followed Queen Victoria’s marriage in a white lace gown, is that whatever the time of year, you can always find white flowers of some kind. Besides being available in the markets all the time, white is so adaptable in other ways. It can spell city smart, country romantic, clean cut modern, vintage glamour, space age futuristic, artful detail or boho blousy. White can be crisp and cool, or soft, satiny and sensual. Zita’s design also played with transparency. Finely scripted engraved perspex discs danced in the light, hanging from a tree laden with cherry blossom, hydrangea and ammi – these announced the wedding guests’ seating. 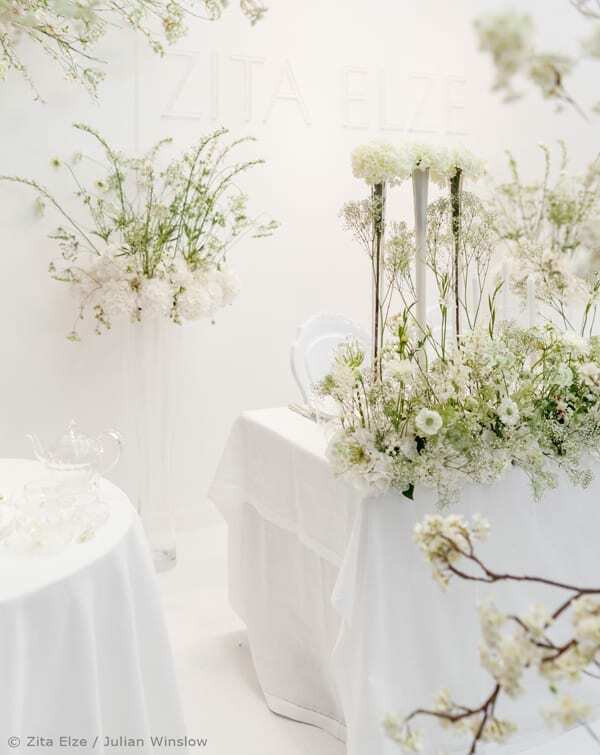 She used perspex chairs and white and pure glass containers for the floral arrangements. 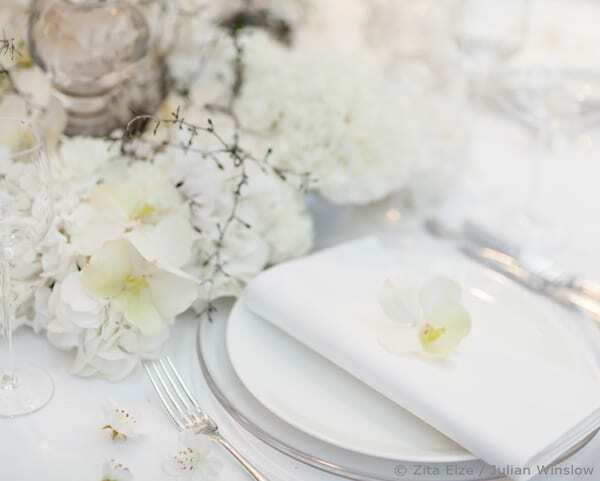 A full length table runner of cow parsley (fresh and silk), ammi, gladioli, dahlia, stocks, rice flower, astilbe, gypsophila and eustoma graced the top table which was dressed with antique crystal and fine silverware for extra glitter. 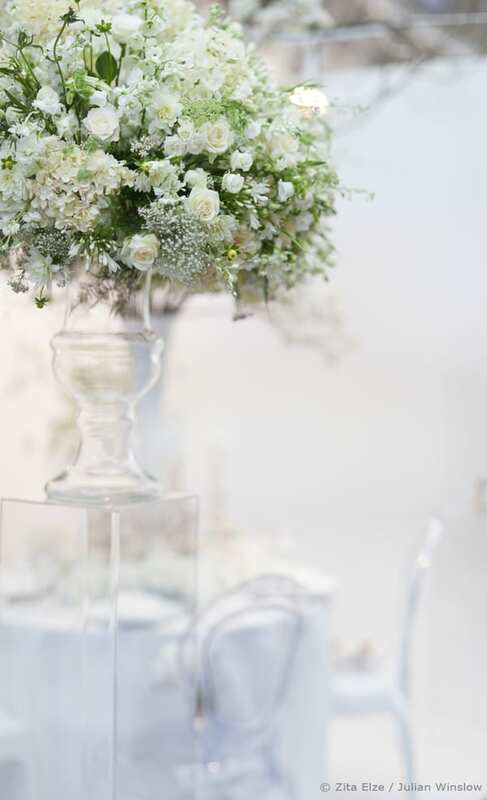 In the foreground, a large pedestal vase overflowed with faux cream hydrangeas, Avalanche white roses, asparagus fern, stocks, campanula, agapanthus, delphinium, gypsophila and dahlias. 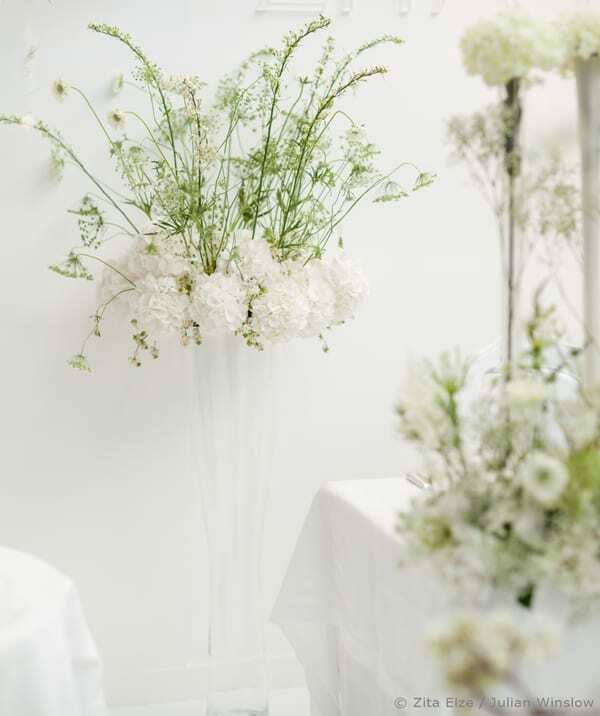 Pedestal arrangements at either side featured hydrangea, ammi, cow parsley and scabiosa. This ethereal wedding design was completed by two bouquets, one in the palest pink cyclamen with cotoneaster foliage, the other in soft ethereal white ammi with baby’s breath. 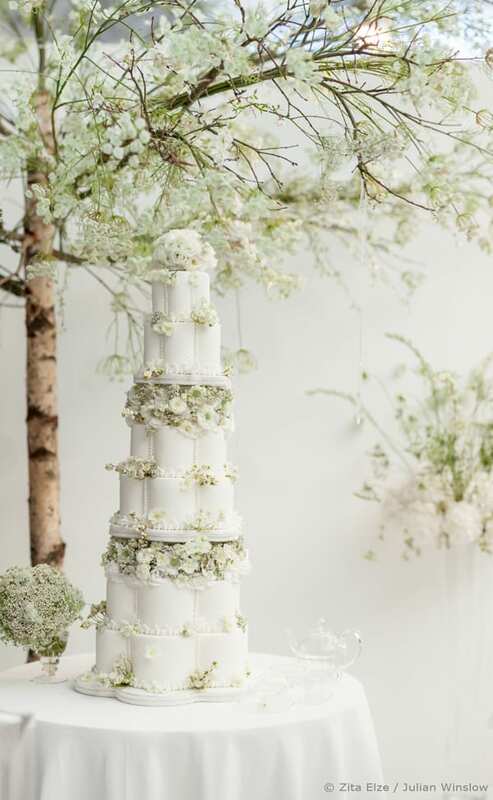 Elizabeth’s Cake Emporium‘s elegant and romantic six tier petal shaped wedding cake was a major feature on the side table, superbly iced then beautifully dressed in fresh flowers and by Zita. If you’d like to see more of Zita’s stunning work, please visit the Zita Elze Flowers website. 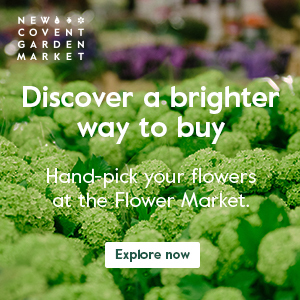 And for details about this year’s show, visit Brides The Show online.